RVers tend to take longer and longer trips as they search for even better places to camp. Because of this, they often end up needing to break their trips down into manageable amounts of time on the road. This then means needing to make an overnight stop in order to safely rest, eat and even get a good nights sleep before continuing their journey to their final destination. But, the Frugal camper may not want to pull into a campground and pay their fees just to stop for a few hours. On the other hand, many other campers do not feel safe stopping at Rest Areas or other dark and lonely roadside sites. If you are planning a trip where you may need to overnight somewhere then you might want to consider using a WalMart parking lot for a relatively safe and free overnights stay. WalMart parking lots are popular for a number of reasons. First of all, the vast majority of WalMart stores welcome overnight campers, except for a small minority who have constraints. There are literally thousands of Walmarts along the roads and highways of America. 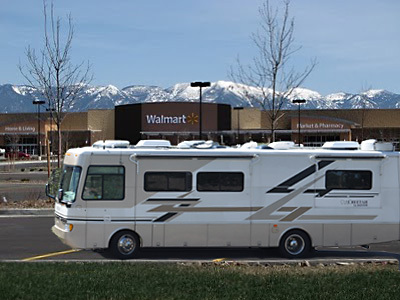 Walmart parking lots are very large and easy to get even the largest Motorhome or towed camper around in. WalMart parking lots are well lit and are considered to be safe places to shop or just stop. When you stop at a Walmart, at the same time, you have access to their vast array of products and food so you can use your overnight stop as a chance to re-provision your camper. If you want to know more about parking at WalMart stores, you might want to click on the link below that will take you to a Yahoo site called WalMartRVing. At this site, you will find that there are thousands of members of this club who communicate 24/7 via email, and are ready to give camping advice or just talk about almost every Walmart in the country. These members can provide provide you with valuable information on; can you park there, is it considered safe, and much more. Previous PostPrevious Operate your Air Conditioner properly and SAVE MONEY!